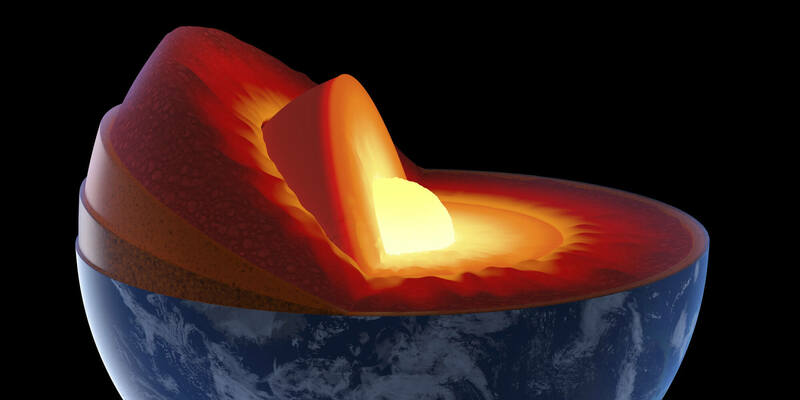 Earth’s interior is way more complicated than you probably thought — turns out it has molten metal and hidden oceans, and parts of it are hotter than the surface of the sun. Check out the video above and/or read the transcript below. And leave your thoughts in the comments. Talk nerdy to me! JACQUELINE HOWARD: Hey everyone. Jacqueline Howard here. Ever wonder what it’s like inside our planet? Come with me on a subterranean tour all the way from the rocky crust where we live through the layer known as the mantle to the wild half-solid/half-liquid core of the Earth. We’ll also be stopping by a newly discovered underground ocean. Let’s go! First stop, Earth’s crust–the solid outer layer where we live. The crust is made up of several elements, from iron to silicon to magnesium to sulfur, and its thickness ranges. The continental crust–the stuff found under land–can be up to around 50 miles thick; while the oceanic crust–the stuff under our oceans–is around four miles thick. But let’s see what lies below that. Now we’re about 50 miles below the surface, at the uppermost region of the mantle. This layer is made up of rock that’s rich in oxygen, silicon, iron, magnesium, aluminum and it extends from here all the way down to around 1,800 miles below the surface. The mantle is also where molten rock known as magma can form before it flows upward during volcanic eruptions–at which point the magma becomes lava. This was pretty much the picture scientists had of the mantle until earlier this year–when a vast hidden ocean of water was discovered some 400 miles beneath North America. It goes to show that the rocks down here have a pretty impressive capacity to store water. Now let’s travel a little deeper. You ready? Phew, back on the surface! If my virtual tour of the Earth’s interior had been a real one, it would have been a first. We all know that no one has ventured beyond Earth’s crust. But how do we know what’s down there? Scientists use waves of energy, called seismic waves, emitted by earthquakes to measure what type of material is inside Earth and where that material lies. See, as seismic waves travel through our planet, the rate in which they’re traveling — whether they’re moving fast or slow — reveals what exactly they’re traveling through, whether that material’s solid, liquid, or something else. Now you know. Leave your thoughts on what’s lurking inside Earth in the comments. C’mon, talk nerdy to me!